It is the Saturday estate sale report! My mom and I went first to one in Amherst, on a street called, well, Amherston. Finding it was a big hassle and then when we got there it was a bigger hassle. However! I got a pair of green hand towels and a four-record box set, "Burt Bacharach and Hal David: A Celebration." "And you cannot say his name without also saying the name of Hal David." I could not get over that! 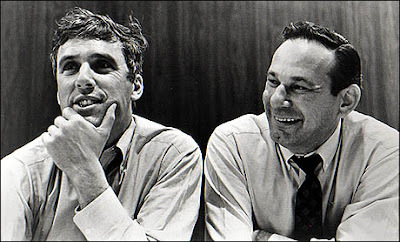 So with George and me it is always Burt Bacharach and Hal David, pictured above. We never mention Burt Bacharach's name without also saying the name of Hal David. True story: I got a text message from George after his first child was born and he wrote, "Coming home from the hospital today and you cannot say his name without also saying the name of Hal David." Ha, ha! I still have that message on my cell phone. I saved it! On the rare occasion that I am blue, I look at it. I have a picture of Leonard Pennario with Burt Bacharach at the races but some things will have to wait for the book. Pennario and I used to gab about Burt Bacharach and Angie Dickinson and these conversations will be invaluable to future musicologists. Here is a nifty picture of Burt Bacharach and Angie Dickinson from Life magazine. Where was I? Estate sales. We went to another off of Englewood. And here I bought two more hand towels, this time in pink. I do like my color pink as they learned over at Beth Tzedek. Also I bought a missal because I like to have a few extras for my Facebook friends who sometimes join me at Mass. This one is a beauty. It is copyright 1941-1958! I also picked up three scapulars. Those are old-time Catholic accessories people used to wear around their shoulders under their clothes and they have promises associated with them. I like picking up things like this at sales so I know they will not get thrown out or treated with disrespect. One of the scapulars is still packed into its little plastic envelope. It says in Gothic script: "Whosoever dies wearing this Scapular shall not suffer eternal fire." That is quite a promise! I guess maybe I should wear this thing! The estate sale people gave that to me free. One guy was going to charge me but this woman working with him said, "Charging for scapulars is bad karma." A fascinating mix of religions in that sentence! Now that I think about it I do not think any sane person would charge for something saying in Gothic script, "Whosoever dies wearing this Scapular shall not suffer eternal fire." You would be afraid you would wind up being the one suffering eternal fire! So. All in all I would say today I had a pretty good haul. Burt Bacharach, and you cannot say his name without also saying the name of Hal David. Plus two sets of hand towels. Plus eternal salvation thrown into the bargain at no charge. Life is good to me! That's all there is to salvation? And isn't Ms. Warwick Ms. Houston's aunt? Talk about the whacko gene!